Myanmar became the seventh member of the SASEC partnership in March 2017. Its participation in SASEC is expected to further promote and accelerate inter-subregional cooperation between South Asia and Southeast Asia and beyond, and will contribute significantly to achieving the future development goals of both subregions. Myanmar became a full member of SASEC in February 2017, following several years as an active observer. Bangladesh, Bhutan, India, and Nepal formed the project-based partnership in 2001. Maldives and Sri Lanka joined SASEC in May 2014. Myanmar's National Comprehensive Development Plan (NDCP) A Prosperous Nation Integrated Into the Global Community 2030 envisions a prosperous country integrated into the global community, supported by strategic thrusts in economic development, environmental protection, and the strengthening of governance and public institutions. In view of the changing global and regional economy, Myanmar intends to focus on integration into the global economic system, emphasizing institutional and policy changes, and implementing sectoral and regional strategies. ADB-financed technical assistance has supported SASEC activities in Myanmar to help advance the country’s engagement in regional cooperation activities, including under the Bay of Bengal Initiative for Multi-Sectoral Technical and Economic Cooperation (BIMSTEC) framework. Myanmar has actively participated—first as observer, and then as full member—in SASEC regional technical assistance projects that have supported regional cooperation forums, knowledge-sharing initiatives, and capacity building. 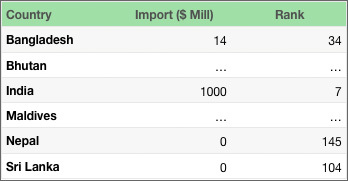 The value of Myanmar's merchandise exports and imports trade with other SASEC member countries, using International Monetary Fund data from 2017, is captured in the tables below. 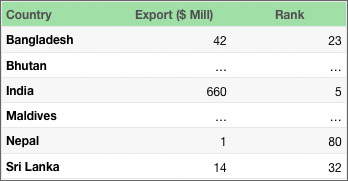 Myanmar's 7th largest import source worldwide is India, with imports at $1 billion. 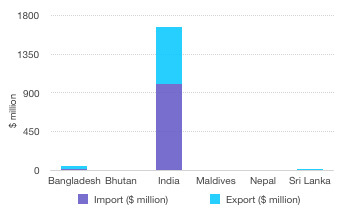 Its 34th largest import source is Bangladesh, valued at $14 million. India and Bangladesh are among Myanmar's largest export destinations—India is Myanmar's 5th largest export market, with exports valued at $660 million. Bangladesh is Myanmar's 23rd largest market, with exports from Myanmar at $42 million. Getting Electricity: Myanmar improved the monitoring and regulation of power outages by beginning to record data for the annual system average interruption duration index (SAIDI) and system average interruption frequency index (SAIFI). Myanmar also made getting electricity more transparent by publishing electricity tariffs online. Note: The World Bank/International Finance Corporation's annual flagship Doing Business Report measures the ease of doing business by ranking economies from 1 to 190, based on quantitative indicator sets that can be compared across economies and over time, with first place being the best and indicating a regulatory environment is conducive to business operation. Of immediate relevance to SASEC aims and goals are indicator sets on Starting a Business, and Trading across Borders. 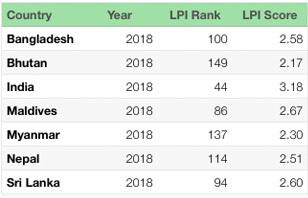 Myanmar's overall LPI score for 2018 is 2.3. The country saw an improved score in timeliness (2.91 from 2.85) and a dip in its scores in the five other categories. It scored 2.28 in logistics competence and 2.20 in both international shipments and tracking and tracing. Myanmar ranked 137 out of 168 economies in 2018. 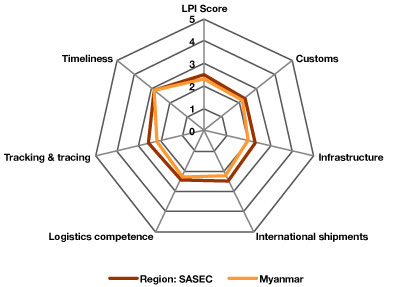 Note: The LPI overall score reflects perceptions of a country's logistics based on six core dimensions: (i) efficiency of customs clearance process, (ii) quality of trade- and transport-related infrastructure, (iii) ease of arranging competitively priced shipments, (iv) quality of logistics services, (v) ability to track and trace consignments, and (vi) frequency with which shipments reach the consignee within the scheduled time. The scores for the six areas are averaged across all respondents and aggregated to a single score using principal components analysis. A higher score indicates better performance. GDP growth picked up in fiscal year 2017 to 6.8%. Inflation eased, and the current account deficit widened. With continued economic reform, growth should be sustained this year and accelerate next year. Inflation will likely edge up and the current account deficit widen further. By pursuing reform to improve the business environment, policy makers can sustain the sizable foreign direct investment needed over the medium term to finance the current account deficit. Real GDP growth in Myanmar is at 6.4% for fiscal year 2017/2018 due to strong exports. Industry and services activity offsets slow recovery in agriculture. Inflation is rising, driven by food and fuel prices and central bank financing of the fiscal deficit. Pace of poverty reduction is likely to remain modest.